Rock Climbing: There are brownstone walls you can climb. They have a ladder, but you can also choose hand climbs while safely hooked into a harness. Once you reach the top, you can zip-line back down. 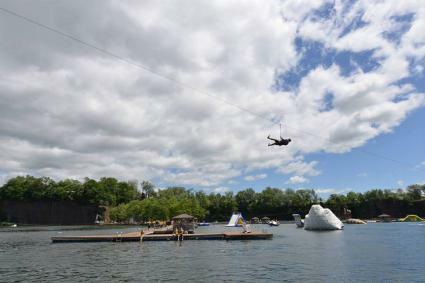 Wakeboarding: They offer three System 2.0 wakeboard runs, with one dedicated to more advanced wakeboarders. Two lines are ideal for beginners, and the "pull you up" system helps even first timers make it up. The advanced run features lots of jumps and rails too. Scuba Diving: The park even offers scuba diving. Local dive centers often bring people there to do their check-out dives for open water certification. 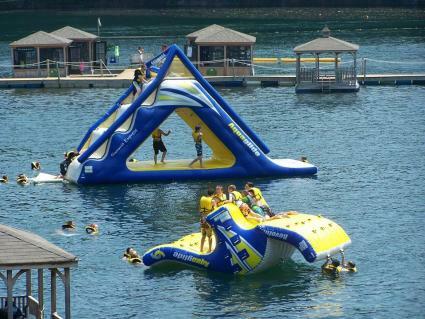 Brownstone offers weekend passes, so divers can train and still enjoy the rest of the park. There are underwater platforms at different depths when you go down. Other activities include hiking, biking, cliff jumping, rope swings, kayaking, snorkeling, and more. Equipment and watercraft rentals, like kayaks and paddle boards, aren't included. Guests may bring their own. The park does provide harnesses and helmets for those who plan to go climbing. Lifejackets are complimentary. Kids under three are admitted free at Brownstone. Non-participants have to pay to enter the park, but there may be discounted tickets for those just supervising or watching family members. There is a Corporate Adventure Pass for businesses who want to do something nice for their employees. These passes provide access to Brownstone Park and their sister park, Powder Ridge (winter, snow, and skiing park). 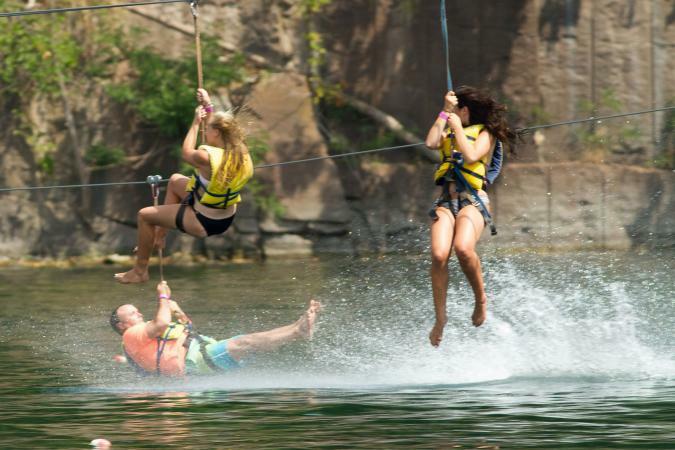 Brownstone offers group rates from 25 people and up. Typical group rates are 10% off for groups of 25 to 99, while groups of 100 to 249 get 20% off, and groups over 250 people get 30% off daily rates. Youth groups receive complimentary passes for chaperones on a 10-to-1 ratio. Reservations and deposits are required for all groups. If your group is planning to do a team building event, or you want to have a private birthday party, Brownstone can arrange these as well. Picnic areas and dock rentals are available for the day. For example, the floating gazebo (for up to 12 persons) is about $175 for the day, while the beach area (up to 250) is just under $600 for the day. If you're looking for discounts, Brownstone offers 10% off for active military members. You must bring your military ID. Local Portland, CT residents can call or visit during business hours to inquire about possible local resident discount tickets. If you join their loyalty rewards program, you'll receive 15% off your next visit. After that, every $500 spent will get $25 off your next purchase. Text EXPERIENCE to 80777 to turn your debit or credit card into a rewards card. Food is available in the park. The concession stands and grilling station are open daily, and include options like hamburgers and hot dogs, grilled chicken, grilled chicken tenders, and more. Brick oven pizzas are made to order, and snack shacks offering various treats are located throughout the park. The park opens for the season at the end of May with opening weekend festivities scheduled for Saturday, May 26, 2018. Check the website for the most up-to-date information on operating hours. Brownstone Park is located less than 30 minutes from cities like Hartford, New Haven, and Waterbury. Getting to the park is relatively easy, as you'll take Route 9 North or South to Middletown, and then proceed eastbound over the Arrigoni Bridge on Route 17. At the 5th stop light, turn left on Middlesex Avenue. At the stop sign, you'll turn left on Brownstone Avenue. Parking is on the right, and it's complimentary. There are several important facts that all potential guests should know before they visit Brownstone. Everyone has to register, and there is a liability release waiver all guests must sign. For anyone under 18, a parent or guardian must sign the waiver. Save time by printing out and signing your waiver (and buying your day passes) online ahead of time. Swimmers have to wear a life jacket or don a wetsuit that provides positive buoyancy. Scuba divers who are not accompanied by an instructor have to present a valid certification card from PADI, or another certifying agency, and they must have their own dive partner. You can bring in food and beverages, but no glass or alcohol. Lockers are available, both small and large options, for an additional fee. If you bring your own wetsuit, it should be 3mm thick at a minimum. Water shoes are recommended at all times. You should have good upper body strength for activities like the rope swing. A woman fell 20 feet in 2014; news reports indicate she may have let go with one hand to hold her nose. 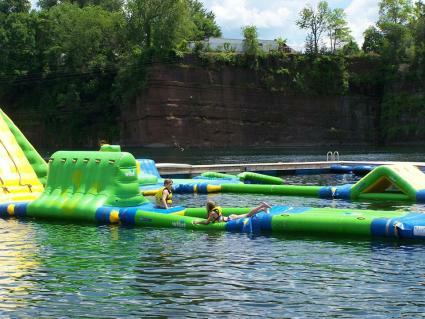 A lot of reviewers love the adventure activities offered at Brownstone Park. Some users noted lines for things like zip lines can get long. According to one TripAdvisor user, you can expect lengthy waits during the summer, especially on a Saturday. They arrived at the park at 10:45 a.m. and were told it would be at least an hour to get in, plus lines for each of the activities. Some users expressed concerns about safety and supervision for their kids on some of the more adventurous activities. Yelp reviewers echo many of the same praise and concerns as TripAdvisor reviewers. One user noted complaints about unfriendly staff, which was also mentioned elsewhere. She notes that the staff is primarily made up of high school and college kids who don't really seem to want to be there. That translated into several reviews where users noted that unsafe behavior was getting by the lifeguards who were busy or otherwise uninterested. On a positive note, many reviewers commended staff friendliness and lifeguard attentiveness. Mommy Poppins has a great write-up on what a typical visit at Brownstone Park is like. She mentions a special 12-and-under section too, which is great for young kids visiting. If you're traveling out of the way with young children, this may not necessarily be a great option, given there is not a lot to do for younger kids. Guests who don't have a lot of upper body strength, are out of shape, or are not physically active may find some activities to be on the difficult side. Overall, it's certainly one of the more unique amusement parks in the world so, if money is not a major concern, it might be fun to pop in for a day, even if you don't participate in all the activities Brownstone Park offers.